My Best of Europe in 21 Days tour has left Austria and crossed through the Alps to Italy. Our first stop: Venice. During some of my free time, I'm taking the opportunity to spruce up my guidebooks. And organizing our travel information on Venice is one of my favorite challenges. 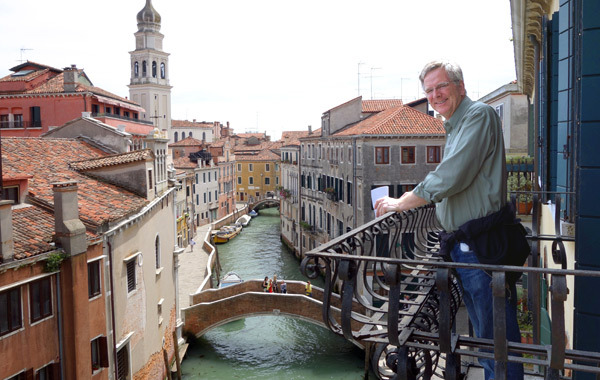 Even after a lifetime of visits, this magical city of canals remains one of the great thrills of European travel. It often seems that the city of Venice has abandoned itself to tourism. The resident population is shrinking, and those remaining have turned old buildings into various kinds of hotels -- some slick and modern... others old and funky. A big part of my work is finding good-value hotels to recommend in my guidebooks. Here, from the top of a friendly little B&B, I can imagine calling this room home, stepping out onto my balcony, and enjoying the view of the back lanes and canals of this great city. Each year, as Venice sinks and the sea rises, floods are more common. 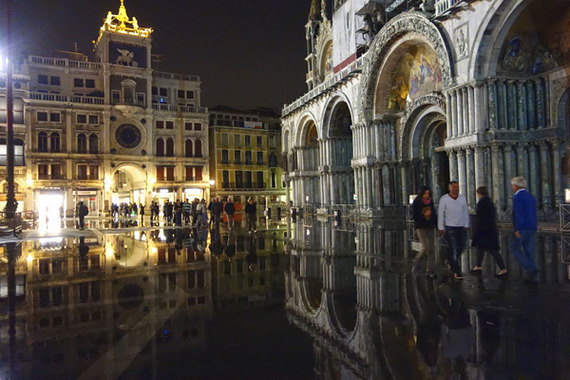 The lowest part of the city -- St. Mark's Square -- floods first. And tonight, it became a delightful reflecting pond. When you get the perfect storm of Sirocco wind, a full moon, a high tide, and high barometric pressure, Venice floods. And St. Mark's Square is the first place where the water invades. One of my magic moments in Venice is to be on this glorious square after dark during a flood. 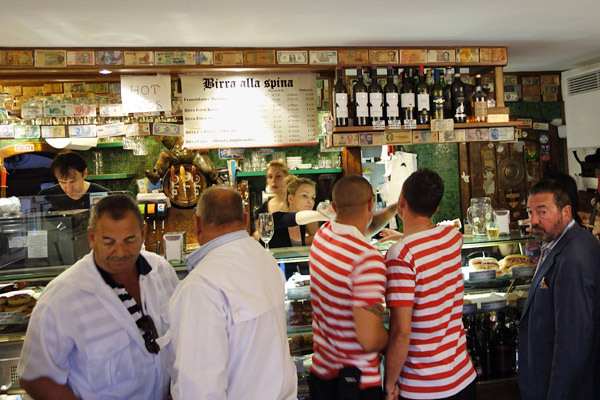 You know you're eating in a characteristic place that's a good value when you share a rustic table with gondoliers in their striped shirts. This is exactly the kind of eatery I seek out for my guidebooks.